Mom's Gone Bronson! : Gift Your Favorite Photos With Mail Pix! Review + Giveaway! Gift Your Favorite Photos With Mail Pix! Review + Giveaway! 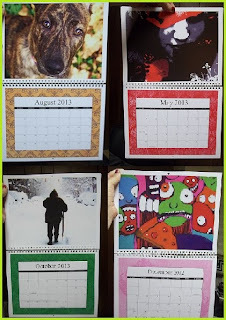 This week I had the pleasure of ordering several photo products from MAILPIX.COM, which is an online company that allows you to print out photos and customize MANY pretty and practical, giftable items such as mugs, mouse mats and calendars! For the purpose of review I received a travel mug, a regular mug, several magnets, a calendar, jewelry box, mouse mat AND 100+ photo prints in 4x6 and 5x7! I was able to customize each item as I saw fit and I have to say that I am VERY pleased with the end results for ALL items as they arrived! The fridge magnets arrived first, with 4 larger ones and 3 smaller ones, I had some printed out with photographs of my friends children as gifts for her and some with art that my husband or I have made over the years, to see how well they fared as prints instead of classic photos. - I am happy to report that all 7 of the magnets turned out perfect and will make wonderful additions to any fridge! The regular sized 4x6 prints turned up next and like with most photographic prints they turned up as expected, well packaged and undamaged in the mail, wonderful quality and clear, crisp prints! Just as I wanted! The larger 5X7 photos, of which there were several, also turned out great! No fussiness or blurring, perfect! Next to arrive was my calendar! I was extremely excited to see how that turned out as I had taken, once again, several works of art and photography that my husband and I have produced over the years and sorted them throughout the calendar. I spent quite a lot of time on the Mail Pix site in order to do this, but it was VERY WELL worth it! Each calendar month plays host to ONE picture, but you can mix and match photos and include several on one page if you so wish! I personally wanted to used one per month to showcase our work, which is why I limited the photos. I uploaded larger, better quality photos for the larger works and the results are certainly better than I had expected! The last package I received contained the 2 cups, a jewelry box and a mouse pad - all of which printed perfectly well! The travel mug has all of my children on it, which includes my dog! The mug has 2 photos of my doggy on it also and the jewelry box has a pretty photo of my daughter and I (which is appropriate because the box is a gift for her to store her little bits and pieces of Jewelry that her nana keeps bestowing upon her each time we visit!) . The mouse mat was something I was a little skeptical about because I had used a photo that I had taken from a piece of collage artwork that I had made several years ago and had that printed on it! I wasn't too sure how well it would print out as I hadn't tried anything like that with this particular piece of art before BUT, the result? PERFECT! I absolutely love it and am now considering printing off a few more as gifts this year for Christmas or other occasions, where something a little personal might be in order - I do love gifting my artwork as I know no one else right now has this on a mouse pad, it is UNIQUE and I LOVE that! Overall I am thoroughly pleased with the outcome of every single one of the items ordered over at Mail Pix and I would definitely use them again! The only gripe I had was that the uploads were a little slow, but actually, it was wel worth the wait on the larger files for the quality of the finished product! Speaking of products! The good folk over at Mail Pix would like to give ONE of Mom's Gone Bronson's lucky readers a $20.00 credit towards ANY purchase on their site, which is enough to buy a calendar, mug, magnets or prints (among other items) of your own and which will make for some wonderful gifts or keepsakes! To enter is simple! Just open up the rafflecopter below and like, follow and comment for entries and you're in! There is no mandatory entry so you can do as many or as few as you like and all entries will count! - The giveaway will run through to December 9th and the winner will be selected by December 10th and will have 48 hours to claim their prize! This should leave you enough time to order your goodies in time for Christmas (postal services permitting!) and create some smiles! Note: Mail Pix is responsible for the fulfillment of this prize, not Mom's Gone Bronson! You will need to sign up for a Mail Pix account, which is free, in order to receive your credit to your account. You will not receive money, paypal or any alternative - prize will be Mail Pix account credit only. Thank you! I would like to see one of my pictures on a billboard or a magazine. But realistically I would take a throw that I could keep forever and pass along to my granchildren! Coffee mug, or it'd be fun to have a notepad of paper with a series of my kids pictures! A blanket would be neat! I would love the Blanket! I'd love to see it on a blanket or throw but it would be pretty neat to do a puzzle too!